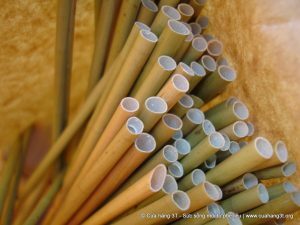 As plastic straw bans come into effect around the world, a Vietnamese man has come up with a creative, natural alternative. 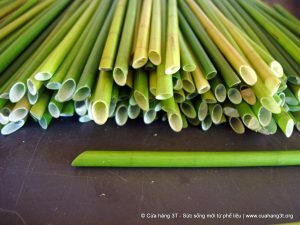 Tran Minh Tien is the owner of Ống Hút Cỏ, a company that makes two straws out of sedge grass, which grows wild along the Mekong Delta. The hollow stem of the wild grass is naturally shaped like a straw. All he has to do is cut the ends even to make straw-sized tubes. Then he cleans out the insides with an iron rod and washes them. 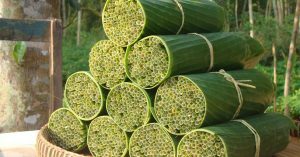 Next he uses banana leaves to wrap them in bundles of 100 straws to be sold. 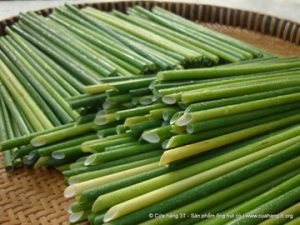 Tien’s straws come in two varieties — dried and fresh. The fresh straws last about two weeks in the fridge. The sun-dried, oven-baked straws last up to six months at room temperature. When you’re done with a grass straw, you can reuse it, compost it or even eat it! Chewing on them after a meal helps clean your teeth and gums, the company says. The fresh straws cost 2 cents each, while dried cost 4 cents each. Zero Waste Saigon, which also sells the straws, says that finding a human use for the grass, helps preserve wetlands, which provide habitat for Sarus Crane birds, because it prevents them from being turned into crop land.